Of all the Auction Watch cars we have featured lately this Fiat 500 and it’s Graziella 300 caravan has to be the most fun. We reckon it is even more fun than the super rare Fiat 500 Vetri Fissi we featured back in March (read our article on that one here). While that Fiat was special due to its rarity and being one of the few early fixed window examples left, this Nuova is equally as special as it comes with a period correct caravan. 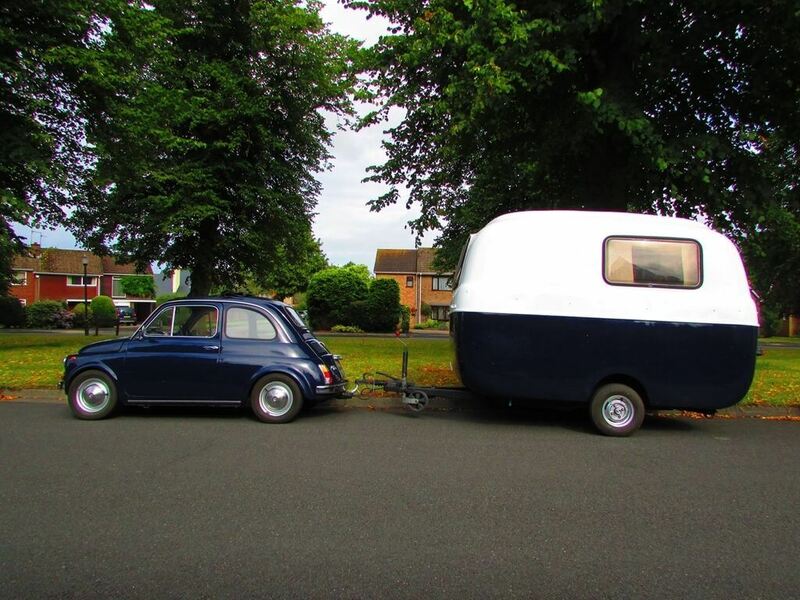 Thought you couldn’t tow a caravan with a Fiat 500? Well apparently you can. Back in the 1970s a company in Italy came up with the idea to build a small caravan for the Fiat 500. 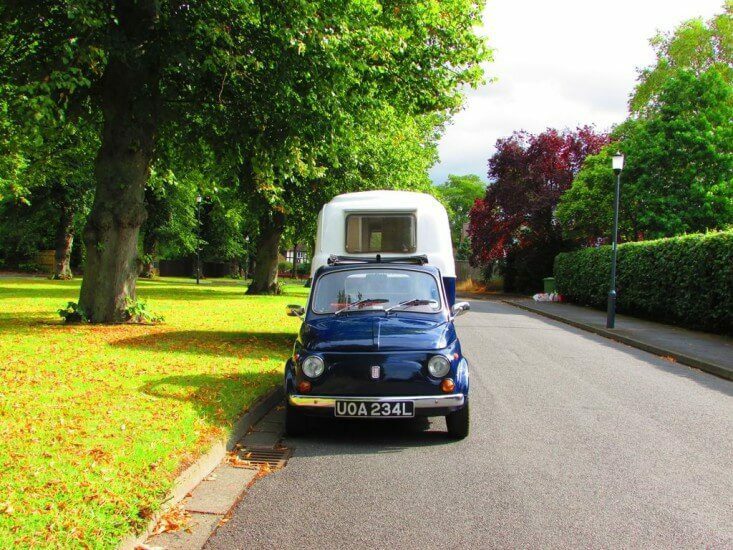 Developed by Italian caravan maker Glazier, they came up with the idea of a light weight caravan which even the little Fiat 500 could pull. Made from fibreglass, the Graziella 300 was named after the Italian newspaper Grazie. Unfortunately the caravan wasn’t a success and the firm went bust after producing only a few hundred examples. Very few are now left today which makes them rare and sought after. What a combination! 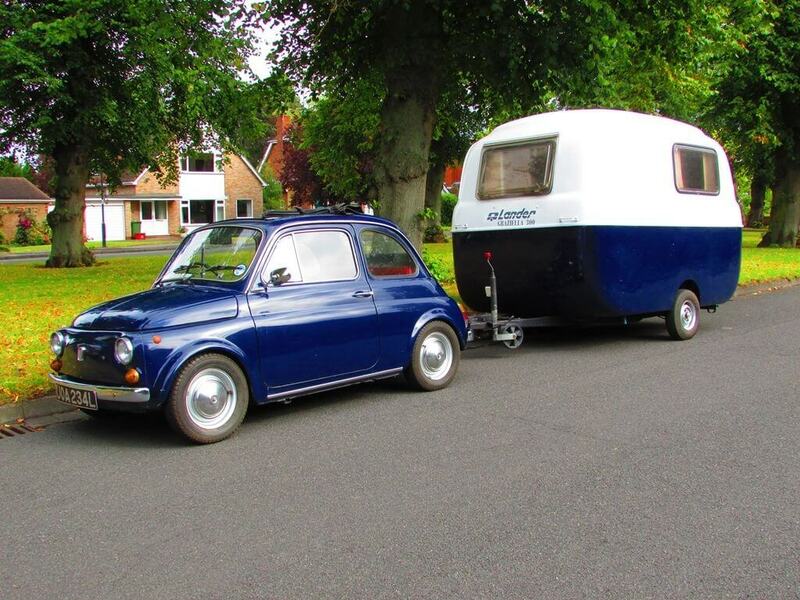 We have never seen a caravan behind a Fiat 500 before. We love it! This Graziella 300 is described as being in very good condition. It recently had an overhaul of the hubs and brakes and the windows have been resealed. Finished with a white and dark blue two tone paint job, it complements the Fiat 500 very well. 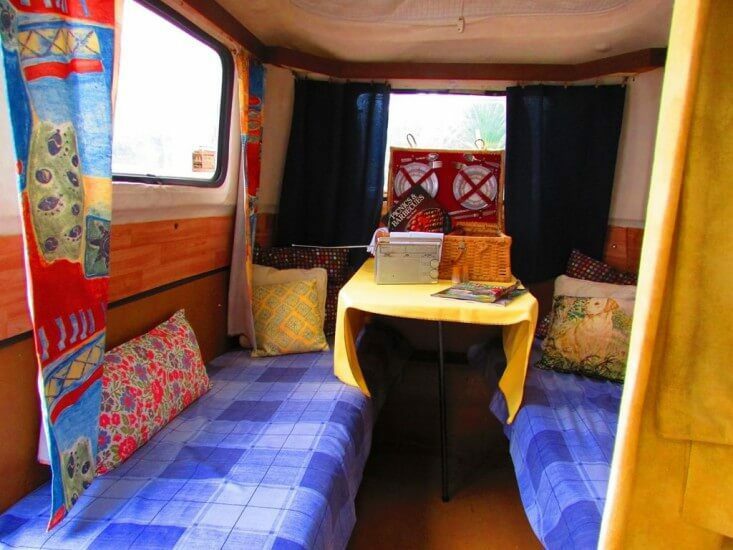 The inside of the caravan is very simple but it presents well. Given its intended towing vehicle, there isn’t a whole lot inside. Its all very simple and very basic. If you want to boil a kettle for a cup of tea, you’ll need to bring a camping stove. No photo is provided of the front of the caravan. We’ve seen others with a cupboard by the door, though there is no way of telling for for sure if this one has anything fitted there. It does have sleeping for two and a small drop down table. The interior looks in good order. Personally we’d change the fabrics. It wouldn’t take much to change these and transform the look. 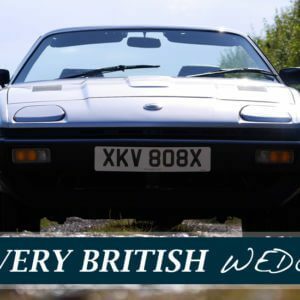 The car itself is said to have been imported to the UK from Monaco in 1998. It underwent a windows out respray not long after its arrival and was modified to tow the Graziella. These modifications included a lowered ride height, wider wheels and a period correct tow bar. This webasto sunroof Fiat 500 has been with its current owner for 17 years and has 14 MOT certificates for this period of ownership. 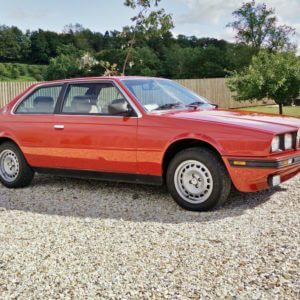 It has covered 50,500 miles and has a valid MOT until July 2016. 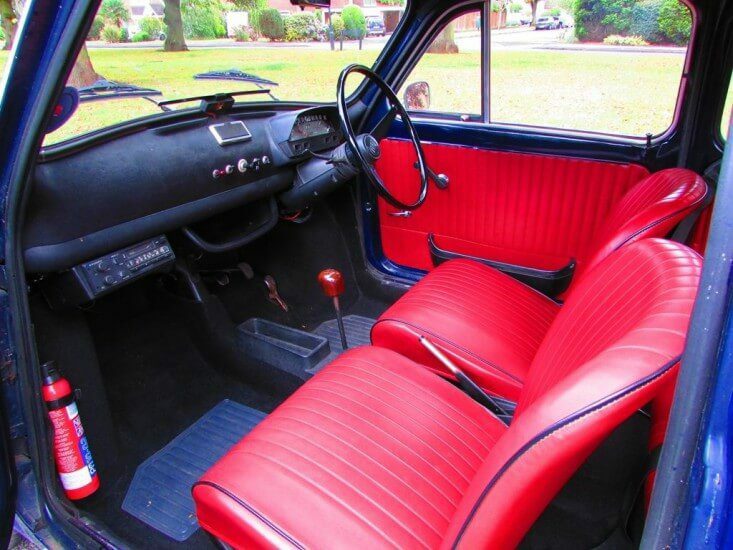 The interior looks very clean and tidy as do the seats. We’d change the gear know for a more traditional one and replace the modern stereo with something more period looking. At this point we feel that we have to admit to not being particularly interested in caravanning. However one look at this Fiat 500 with its matching Levante Graziella 300 has us thinking otherwise. It looks super cool and is about as retro as you can get. The two tone paint job looks great on the Graziella and matches the little Fiat really well. It conjures images of trips to classic cars shows, club meets and even the odd weekend trip to the seaside. The listing mentions taking it to the Goodwood Revival and this is exactly the kind of event where a combo like this would shine. Also retro events such as London’s Classic Car Boot Sale are becoming increasingly popular. This little package would be the ideal if you wanted to dabble in selling some retro gear. Plus you’ve have somewhere comfy to sit throughout the day. And you’d look very cool and retro while doing so. The first thought that entered our head when we saw this combo, was power. Obviously the 500cc engine in the Fiat 500 is tiny and only produces around 18BHP. The reduction in ride height would help reduce drag and the wider tyres would give more grip and would certainly aid towing. However we can’t get away from the tiny amount of horsepower on offer. We would be tempted to tweak the engine with some Abarth components and a sports exhaust. You could even drop a Fiat 126 600cc engine in there for a bit of extra go. At the end of the day you could throw many thousands at one of these engines if thats where you wanted to go. A few extra BHP would certainly help on longer journeys. A Fiat 500 turns heads anywhere you go. With a caravan attached it will be a guaranteed centre of attention. Probably the most fun you could have on 6 wheels. With an estimate of between £23,000 – £26,000, this Fiat 500 plus Graziella 300 is priced a little on the high side. Coys sold a cream combo in their Monaco auction last year and that made €25,960. So roughly £19,000 give or take. That car was left hand drive though whereas this one is right hand drive (we assume it was converted though the details don’t mention this). The price does reflect its rarity however and it will be a while before another Fiat 500 Graziella 300 combo comes up for sale again, especially in the UK. If you fancy buying something a little different, then this charming little package is the one for you. More details on this Fiat 500 and it’s Graziella 300 can be found on Classic Car Centrals website.